Scottrader streaming quotes is a free tool from Scottrade that allows its customers to access real-time streaming stock quotes online without paying any additional fee. I have been a Scottrade customer for more than 10 years. As a long time user, I am glad to see that Scottrade keeps introducing new or improved products to its customers. This time, it’s the Scottrader Streaming Quotes tool, with more enhanced features. As I mentioned in my broker web-based trading platform comparison post a while ago, though all discount brokers offer real-time quotes through user’s web account, not many of them have streaming quotes, which means that with those brokers which don’t stream real-time quotes, you will have to manually refresh the screen in order to get the latest stock prices, which isn’t really convenient when entering an order. Scottrader is Scottrade’s streaming quotes tool which allows you to get real-time quotes of both stocks/ETFs and options. Even though the Scottrader itself looks like a standalone tool, it actually is a web application from what I can tell because the tool can only be launched from within the account. What’s convenient with Scottrader is that you can trade stocks, whether they are securities you already own or want to own, right from the tool, eliminating the need to go back to the web trading platform to place an order, which is the only way to trade for many other discount brokers. With Scottrader, you can either view your positions, or create a list of stocks you want to watch (you can have up to 40 stocks in the watch list, which can be created at the web and imported into Scottrader). But getting real-time streaming quotes isn’t the only function of Scottrader. You can also do research with it, even though you don’t have as many functions as you have with ScottradeELITE, Scottrade’s true standalone trading platform. With the Chart tool, you can draw charts with frequencies from 5-minute to monthly, add trend lines, and compare the price chart with such indicators as Simple Moving Average or Linear Regression Line, etc. If you want do more comprehensive research, you can also go back to your Scottrade web account from Scottrader to access more stock, ETF, or mutual fund research tools. You can also access latest market news from Dow Jones News through Scottrader and see most active stocks (in volume, price change, and price change percentage) on NYSE, NASDAQ, AMEX, and Options markets. As I mentioned above, Scottrader isn’t really a standalone tool. To use it, you need to download a small file from within your Scottrade account. It’s a Java web start file (with .JNLP file extension) that’s used to Java programs on the web. From my experience, it seems that every time you want to run the program, you have to download it again, even though you have downloaded it before. I tried to run the one I downloaded and it always gave me an error like “Your session has expired. Scottrader will now close. Please log into the web site again to start a new Scottrader session.” Even after I logged into the my web account, the program gave me the same error and didn’t run, unless I downloaded the file again. Nonetheless, Scottrader is still a very convenient tool, especially if you don’t want keep going back to your web account and refreshing the screen to get the latest prices. BTW, if you are interested in getting a Scottrade account, here’s how you can get 3 commission free trades. 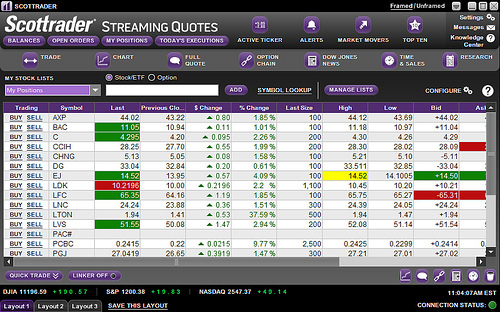 Scottrade’s new streaming/trading tool is very powerful and gives the common trader more insight into the markets. I agree with this article that the launching is a tad cumbersome. What is important is perhaps a possible bug in the system or an ill thought out authentication scheme. To the best of troubleshooting, and multiple calls to Scottrade tech support, I could only conclude that the Streaming application carries the original account it was launched from. More importantly, if you closed off the browser, but left the streamer running, you chance having the same trade executed in both accounts. This is what I experienced. 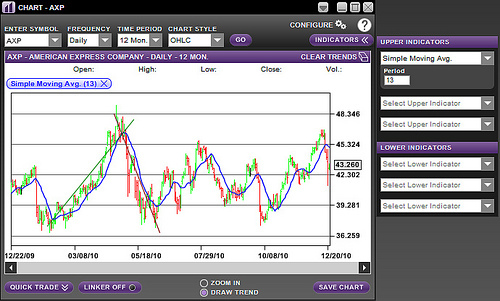 Scottrade would never admit to it on the phone, but do keep this in mind as you enjoy this new tool. To prevent this, be sure not only to log out and close your browser sessions, but also to completely shut down the streaming application before reopening both with the account credentials you intend to trade with. Otherwise, you may experience the same as I did and see the same trade executed against both accounts. For those individuals with more than one account, say a roth and a daily trade account, this bouncing back and forth isn’t very doable. But beware the consequences. I love the new interface… Colors etc. I haven’t had any troubles with Scottrade. I like Scottrader. Creating watch lists with customized fields makes keeping track of a large number of positions easy. Trading stocks is very fast thanks to the quick trade menu. Unfortunately you can’t use this menu to trade options. Scottrader – good for high frequency stock trading, less so for options trading. i can not get the new scottrader to come up. The old one will. The new one used to and now just clicks off. Internet explorer says Scottrader.jnlp couldn’t be downloaded. I have all the latest java installed. I have tried about everything that scottrade has suggested. How can this be resolved? The problem is, I can not download Scottrade Screaming quotes and had it before. I have the new java version 7 and lost the screaming quote when I went to the new firefox 13 and even I went back to the old 3.6 firefox, I can not download it again and not even with the old java. I called scottrades tech support 4 times and they can not help me and I need it. What can I do? Is there anyone out there who can help?